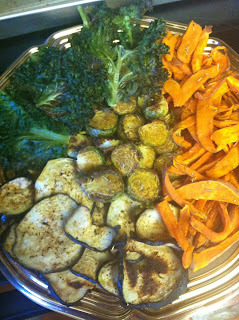 Choose any array of your favorite veggies, season them, roast (or even grill) them and arrange them on a tray. A healthy and tasty snack that even the kids will enjoy. Here, I coated two extra large cookie sheets with grape seed oil. On one sheet, sliced sweet potatoes and brussel sprouts. On the other sheet, sliced eggplant and kale leaves. I love roasted veggies because they're so easy and versatile. You can really choose any of your own favorite spices and veggies to use and it will come out fantastic. Sweet potatoes and brussel sprouts: toss in refined coconut oil, sea salt and cracked rosemary. Cook at 400* for about 45 minutes, or until brussel sprouts become soft & brown, and sweet potatoes become crunchy. Kale: Rub with coconut oil and sea salt or garlic salt. Bake at 400* for about 15-20 minutes, or until crispy, like chips. Eggplant slices: lemon juice and black pepper. Bake at 400* for about 30 minutes, or until desire consistency. Again, I prefer slightly crunchy. Other veggies you can do this with: Broccoli, cauliflower, other varieties of potatoes, sliced zucchini and squash.